My daughter is now a teenager and comes home from school with similar complaints. A girl at school is spreading untrue rumors about her. My daughter also told me how she hated this girl. I replied the same way my mother did. Except, I explained that hate only breeds more hate. 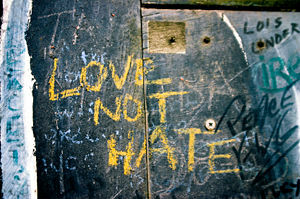 To hate someone or something only hurts you, no one else. My daughter hating this person she feels wronged her will only cause her to hurt herself more with negative emotion, every time she thinks about this person. Every time she tells a friend or family member about this girl, she will be refueling her own negative fire. Thus, she will only end up hurting herself more. The other girl does not feel every occasion my daughter is upset, or reliving the hurtful situation that occurred. In reality, my daughter is punishing herself every time she thinks about how this person wronged her. This is what we all tend to do, when we find ourselves in similar or hurtful situations. We are in control of our own emotions. No one can ‘make’ us angry. We are in control of how we feel. No one has the power to make you feel anyway if you don’t let them. I hear my children often say things like, “Well, they made me mad”. I always reply with “No, you chose to get angry”. They didn’t make you do anything! We all need to accept responsibility for our own emotions. And, realize that true forgiveness is the only way to emotional freedom. Also, realize that all the hate and anger we harbor inside ourselves affects our well-being. Bottled up hate and resentment brings about all kinds of illness and disease. Our physical health is a direct result of our emotional health. Push anger and resentment aside, out of your life. And, I promise you will live a happier and healthier life.